The rugged SportDog 1800 Trainer is versatile and excels in all hunting and training environments. Both the Transmitter and Receiver are waterproof and submersible. 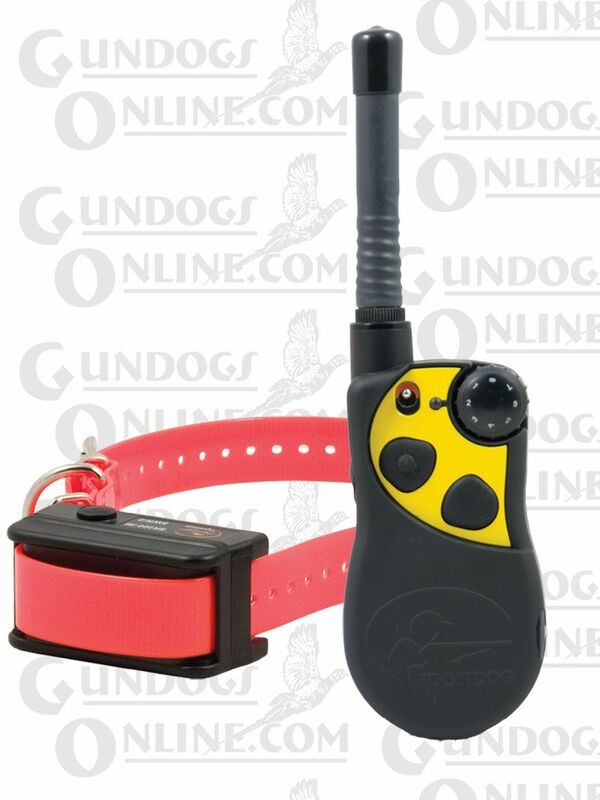 This electronic dog collar was built for the upland hunter who needs a rugged well built training collar. The lifetime warranty combined with SportDog's new rechargable design give solid performance that will not break the bank. The SportDog SD-1800 Trainer can be expanded to control up to 2 dogs by adding SportDog Brand Add-A-Dog collars. Adding dogs to the SportDog 1800 is as easy as turning it on. The collar (receiver) is 100% waterproof and has been designed as a slimmer version of the SD-1200s collar. The collar weighs 9.6 oz and measures 3" x 1.5" x 1.5" and comes with a 27" biothane style strap. Gundogs Online recommends that you register your SportDog product with the manufacturer at the time of purchase. Warranty cards are included with your purchase. Click here - SportDOG SD-1800 Owner's Manual.